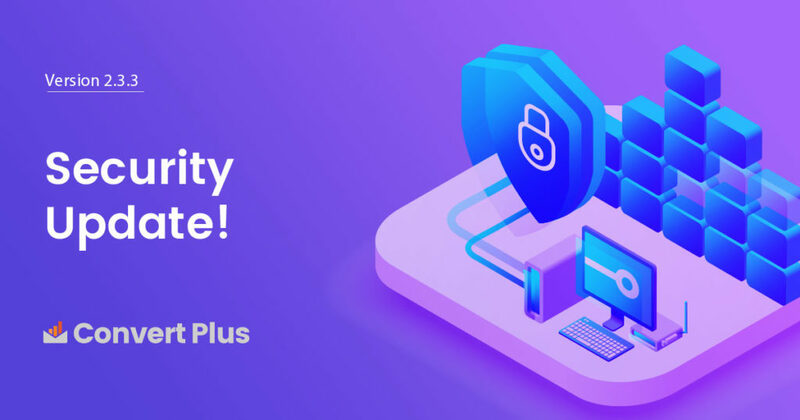 We are back with an important update of ConvertPlus! This is a security update and we’ll be releasing it as ConvertPlus version 2.3.3. The vulnerability was reported privately by an expert security researcher. And, it is highly recommended that you update all the older versions of ConvertPlus and make sure you have the latest version, 2.3.3 installed on your website. – Fix: Fixed slide in and info bar module export functionality bugs. – Fix: Removed PHP notices on style list screen. – Improvement: Code hardening for better security. – Improvement: Added user capability checks for admin actions. – Improvement: General code cleanup. Although it sounds scary, there is nothing to be worried about for now. You just need to update to the latest version to make sure nothing affects you in the near future. The fixes and improvements are very important. Therefore, we request you to update ConvertPlus ASAP. We are here to help! You can always get in touch with us in case you some help or guidance or just want to drop in a Hi! Wish you all a wonderful time until we write again!